A butter lover's dream! 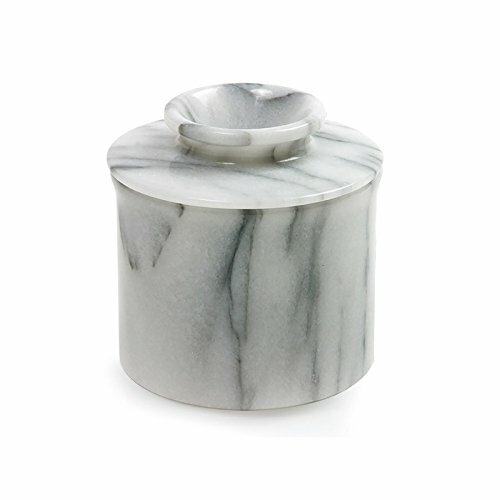 Once you start using this butter keeper, you won't settle for hard butter again! Holding up to 1 stick of butter, the water in the base seals out air to keep the butter soft, sweet and spreadable for up to 30 days - without refrigeration! Simply pour approximately 1/2" / 1.25cm of water in the basin, fill the top of the butter keeper with butter, turn it upside down so the water is covering the top of the butter, and PRESTO! Soft, sweet, spreadable butter that stays fresh. (Water should be changed every 2-3 days). Made of attractive marble, that naturally keeps butter cool. Beautiful to display on your table or counter top. Hand washing recommended. Helpful Tip: Allow the stick of butter to soften first, then pack the butter into lid.